Well, after an afternoon walking in the local country park, I persuaded Mr Plummy Mummy that I was just too tired to cook (hand on brow, lots of sighs going on). Curry in Scotland is a serious affair and restaurants up here often win national awards, so expectations are always high. So far my experiences have been limited to take outs and the odd meal in Dundee. In fact, hubby proposed to me in Dil Se – a Dundee restaurant. Don’t groan… he had wanted to go to an Italian but I was dying for a curry that night. Mind you, we had spent the day beside the river Tay in beautiful Scottish sunshine and he had had the ring in his pocket. So raspberries to him. 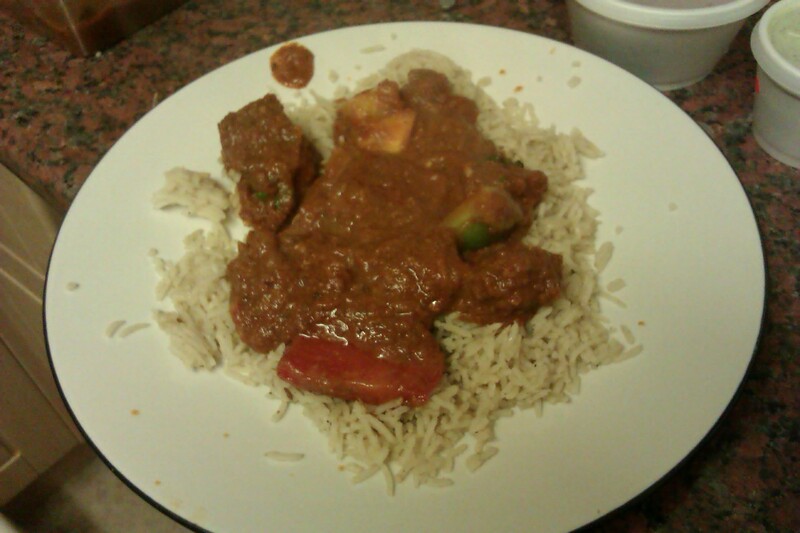 Anyhoo, after seven months of being in Scotland again, I thought it was about time we had curry that I hadn’t made. We decided to order a takeaway from Ashoka Shak in Livingston, which is part of a chain of 14 restaurants, most of which are in Glasgow. You can even buy a cookbook for the meals they serve! We went to the one in Dundee last year for our wedding anniversary (can you see a theme to my wedding related adventures?). A quick meal before going to the cinema across the car park. That meal was fine but spicy. 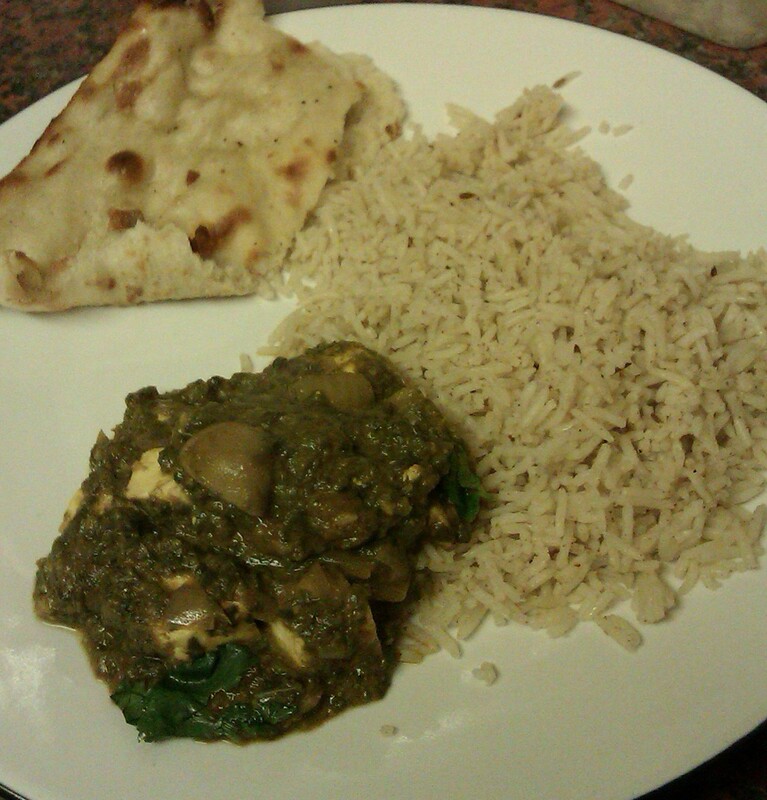 I had a paneer dish – a little strange in that there was no veg in the meal so it ended up being a bit too cloying. Hubby went for Lamb Jalpuri (£7.95) as his main. The order was completed with pilau rice each (£2.25) and a nan (£2.25). At the moment the Livingston branch is running an offer where you can order a curry then get a second one for £1. The delivery took about half an hour, which was a reasonable time, and the food arrived very hot. The portions were quite large and I was pleased that the pilau rice was more natural brown looking then the normal multi-coloured affair you get in restaurants. We dished out the food and started to tuck in. 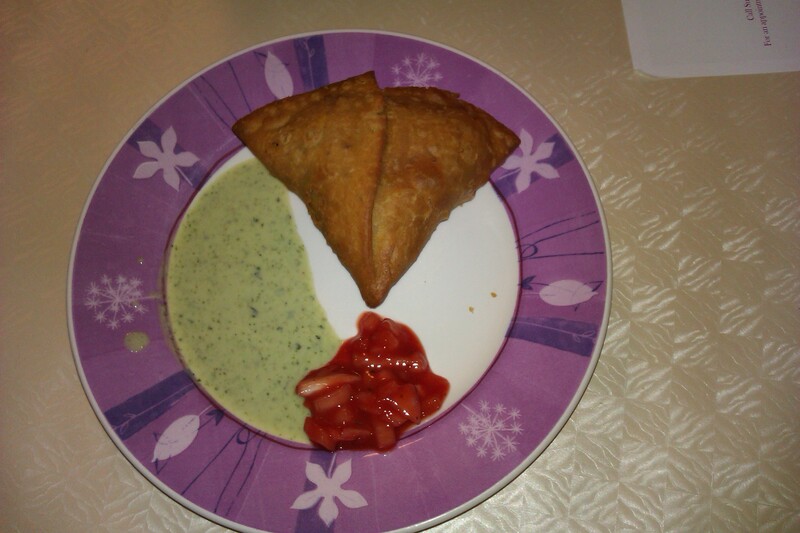 The samosa had a potato and pea filling with the thicker crust found in Punjabi cuisine. I liked the taste of coriander seeds but was glad of the accompanying mint sauce as it was spicy. Hubby had half and left the rest. I should have covered my tongue in the mint sauce before tucking into the main, which IMHO was ridiculously spicy. Unfortunately it also didn’t look very appealing as the vegetables were mushed up. I am not sure spinach and mushroom is a good mix now. The paneer pieces were big though, which is a plus. Luckily I had some plain yogurt in the fridge and doused my meal in that. I am also glad we only paid a £1 for it as I’d have been a bit miffed if we had paid full price for it. Now for the picky bit – the pilau rice had a chalky starchy taste which usually happens when basmati rice hasn’t been rinsed enough prior to cooking. A Turkish mate of mine never washes her rice but I like the taste of her cooking so I forgive her. However, as I was in major critical mode, the pilau wasn’t good enough and again we left a lot of it uneaten. Mr Plummy Mummy said his meal was also spicy (like the one he had had in Dundee). Now here is where he and I differ, and as we have now had two meals from Ashoka Shak that were too spicy, I would never order from them again. He’s more fair and would try another dish. However, that will be a long time in the future, as for now we are going to try some of the other restaurants in and around Livingston first. Delivery: £1.50 to £3.00. We paid £1.50 and it arrived within half an hour. Specials: Check website as they have a lot of offers on. Ashoka Shak, Livingston McArthurglen Designer Outlet, EH54 6QX. Tel: 01506 416622 or 417799. Open: daily noon-10.30pm. Home delivery 5pm-10pm.